Here’s one of the best-kept secrets in motorcycling: Adventure bikes not only let you explore some interesting places, they’re also some of the best all-around motorcycles ever. And for 2019, we’ve taken one of our best—the Honda CB500X—and made it even better. It gets more midrange power, making it even more fun to ride. A new rear shock with larger-diameter internals for an even better ride. A new, slimmer seat. More suspension travel. A new slipper/assist clutch. And the list goes on. What hasn’t changed, though, is what a delightful all-around machine this is. Its combination of light weight, narrow profile and its powerful engine let it shine on winding back roads, but also make it enjoyable to ride on urban commutes. The upright seating position just feels right to so many riders, and lets you sit up straighter and see what’s going on around you. The twin-cylinder powerband is just about perfect for the riding most of us do, with plenty of torque and easy-to-access power. Passenger-ready, it’s big enough to share the fun, too. 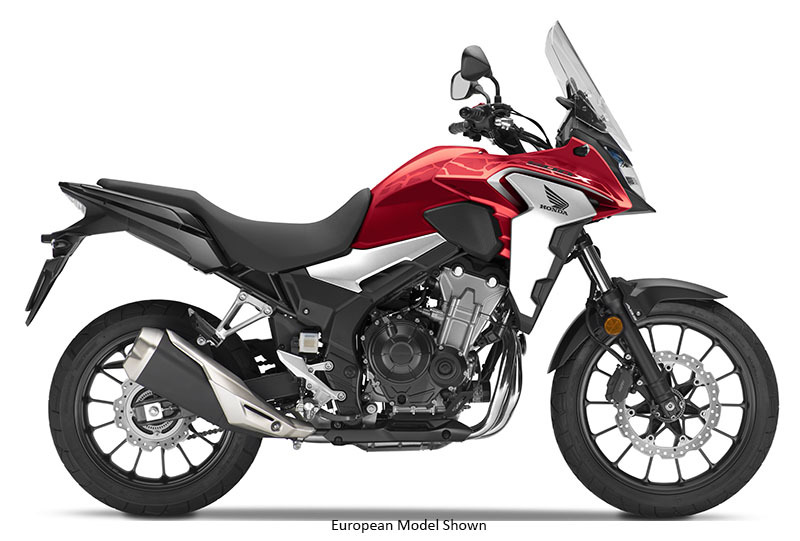 The new CB500X. The right size for real-world adventures, and just plain fun. NEW EXHAUST: Who doesn’t love the sound of a twin-cylinder motorcycle? We gave the CB500X a new muffler this year with twin exit pipes. It’s a little thing, but it’ll make you smile every time you ride. ANTI-LOCK BRAKES: Want a version of the CB500X with Honda’s Anti-Lock Braking System? An excellent choice! Just ask your dealer to show you the CB500X ABS. It’s a great feature that helps you make smoother, more controlled stops under less-than-ideal riding conditions. STEP SEAT: The CB500X gets a new seat for 2019. It still gives you an open, unrestricted riding position that’s perfect for both touring and commuting, and that still offers room for a passenger. But this year we’ve made the seat’s shoulders narrower, so it’s easier to put your feet down at stoplights or in parking lots. PRO-LINK® REAR SUSPENSION: A sophisticated chassis with Honda Pro-Link® rear suspension, with 9-stage spring preload and 5.9 inches of travel gives you a comfortable ride over small bumps, while capably absorbing bigger bumps to increase riding comfort and handling. A new shock absorber for 2019 features larger-diameter internals for even better damping characteristics and a smoother ride. SMOOTHER TRANSMISSION: Our engineers reprofiled the shift dogs in the transmission, to help you get smoother shifts every time. You’ll never see these parts, but you’ll feel their effects. STEEL-TUBE FRAME: A motorcycle’s frame is the basis for its handling. 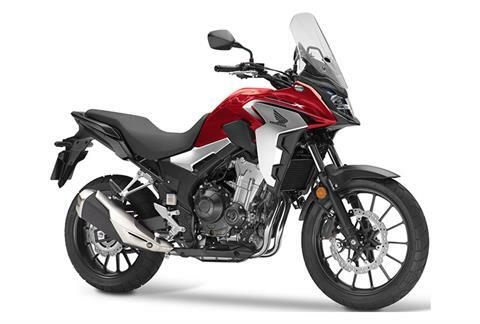 The CB500X’s diamond-shaped steel-tube mainframe ties to the engine with four mounts, offering a rock-solid foundation for superior ride and handling. It also contributes to the CB500X’s generous 7.1-inch ground clearance. PROGRAMMED FUEL-INJECTION (PGM-FI): New injector bodies this year help the CB500X make even more power. The bike’s PGM-FI continuously monitors several variables to ensure the correct fuel mixture is delivered for the existing riding and atmospheric conditions for crisp throttle response throughout a wide variety of riding conditions. UNIQUE STYLE: Like your favorite blue jeans, the CB500X just looks right—tough, capable, no-nonsense. Plus, the adventure-bike posture and seating position let you move around freely—just like your jeans! SLIPPER/ASSIST CLUTCH: A new slipper/assist clutch lets us lighten up the clutch-lever effort by 45 percent, but automatically locks up tight when you release it. DIGITAL INSTRUMENTATION: A fresh, modern, easy-to-read LCD screen features digital speedometer and tachometer and more, including a clock, odometer, trip meter, real-time and average fuel consumption meters and illuminated engine diagnostic indicators. TALLER WINDSCREEN: The CB500X’s windscreen offers superior wind protection, and is 20mm taller this year. LED HEADLIGHT: With a clean, rough-and-ready look, the CB500X’s LED headlight and multi-facet reflector project plenty of light on the road for visibility. For 2019, the CB500X now features all-LED lighting. LONG-TRAVEL FRONT SUSPENSION: The long-stroke 41mm fork yields an increase to 5.3 inches of travel this year, and a wide handlebar allows for easy steering inputs. DISC BRAKES: The front 320mm disc brake and 240mm rear feature drilled, petal-style rotors that provide strong stopping power. MULTI-SPOKE CAST WHEELS: Strong and stylish, the CB500X’s new, lightweight multi-spoke cast-aluminum wheels—19-inch diameter in front and 17-inch rear—are easy to keep clean, look great, enhance handling and are another CB500X feature that just makes sense.